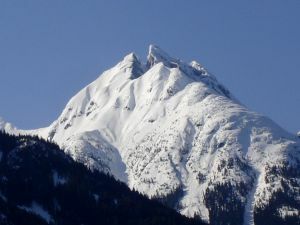 A distinctive rocky, double summit located west of Tenas Narrows at the southern end of Lillooet Lake. Name Notes: This peak is called Gunsight Peak (and is called that in the Fairley and Culbert guidebooks) for the distinctive summit notch. It's source is believed to be the original settlers in the area. The new official name is now In-SHUCK-Ch. This is also the new name of the local native nation, which is composed of the Ska'tin (Skookumchuck), Semahquam and Xa'xtsa (Douglas) Bands, formerly members of the Stl'atl'imx Nation. The forest service road running down Lillooet Lake is also now known as the In-SHUCK-Ch Forest Service Road. NB the "u" in In-SHUCK-ch is pronounced like "book" rather than "duck"
The original native name of this peak - Nes'kato in older documents, In-SHUCK-ch in the preferred modern version - means "Split"; by tradition this peak was the only land not to be submerged during the Great Flood, which was survived by a man named Nta'nenkin, who took one child each from the other pre-deluge families into his large canoe, alternately male and female. When the waters subsided this canoe was beached on a mountain called Smimele, which is near Pemberton Meadows. (adapted from Mrs. Edwards Tales from Short Portage).